John Deere Rolly Tipper Trailer (MCR128822000) will fit any Kids Rolly Tractor. The Rolly toys John Deere tipper trailer with rear tipping is an exceptional toy tractor accessory that will supply a great many hours of entertainment for your children. This farm trailer is easily attachable as long as the attaching toy has some sort of hitch to connect the two toys. The trailer is constructed with high impact blow-molded resin for superb style and durability. The oversized resin tyres have rubberized tread for better traction. The simplistic, single axle construction enables stable and sturdy transportation. The trailer has a weight capacity of 50 lbs. Which allows for safe transport of most loads. This trailer features a rear tipping design to enable quick and easy dumping of loads as well as another option for loading. 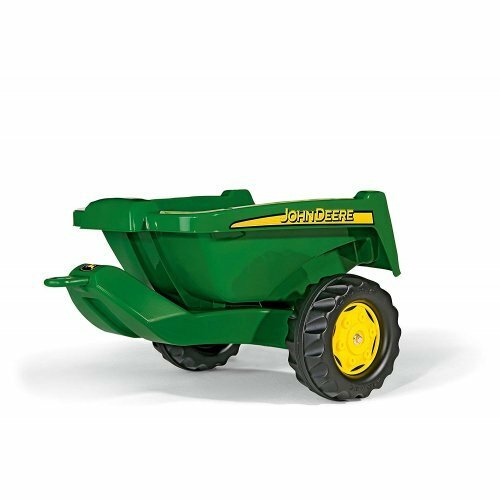 The Rolly toys John Deere tipper trailer with rear tipping is recommended for children between the ages of three and eight years old.